Bowls like this one are rich in omega-3s, vitamin B, and potassium, all nutrients necessary to support healthy mental faculties. Not only does this power bowl offer a delicious, easy-to-make meal but it consists of the brain food essential to preserving cognitive functions as well as preventing illness and disease. 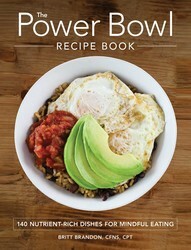 From The Power Bowl Recipe Book. 1. Preheat oven to 400°F and grease a 13″ × 9″ baking pan with olive oil. 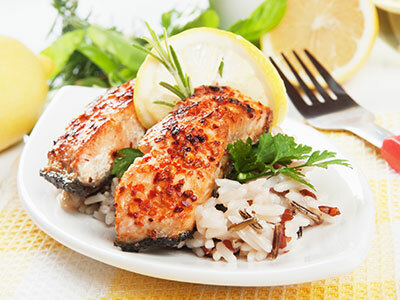 Add salmon fillets and ginger and drizzle with lemon juice and honey. Surround salmon fillets with zucchini, onion, and tomatoes and season entire pan with salt. 2. Bake for 25 minutes or until salmon is cooked through and flaky. 3. Place 1 cup wild rice in each of two serving bowls. Top each bowl with 1 salmon fillet and half the vegetables. Serve hot or cold. Make your meals work for you! Power bowls are the newest nutritional trend--and for good reason. These versatile dishes are all about macronutrients and are packed with whole, nutrient-dense foods that are filling, satisfying, and completely free of empty calories and processed and refined foods. Best of all, the wholesome ingredients can be mixed, matched, and combined to create delicious meals that provide specific health benefits. Inside, you'll find 140 delicious power bowl recipes created to deliver specific nutrients that provide fourteen different health benefits! Britt Brandon is a certified personal trainer; a certified fitness nutrition specialist; and the author of many books, including Apple Cider Vinegar for Health, Coconut Oil for Health, The “I Love My NutriBullet” Recipe Book, and Infused Water. She is a competitive athlete, trainer, mom of three small children, and fitness and nutrition blogger at www.ultimatefitmom.com.